Take breakfast to a new level. 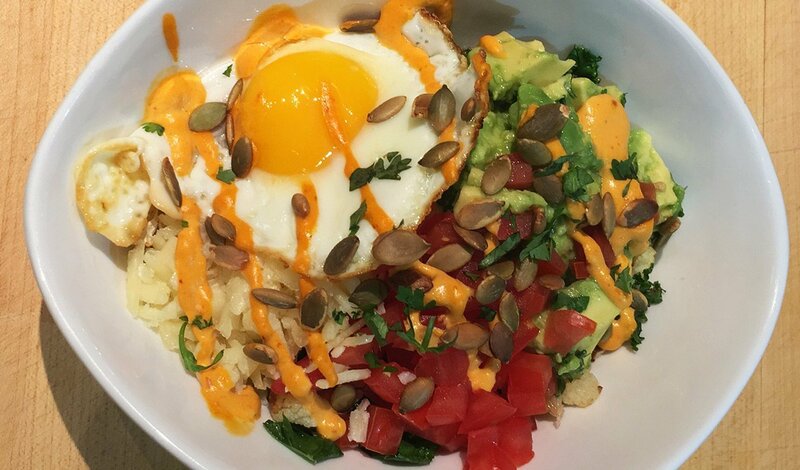 This bowl, topped with a fried egg, combines bold flavors for a unique, plant based dish. Cut cauliflower into 1-inch florets. Toss with oil, salt and pepper. Roast in 450 F oven until golden brown. In a large sauté pan, cook the kale just until wilted, add the garlic, cook 30 seconds more, then add the black beans and cook through until heated. Combine with the cauliflower and set aside. Mash the avocado with the lime juice and season with cilantro and salt. Toss the carrots with oil, salt and pepper. Roast at 450 F until soft and beginning to caramelize. Combine with the Knorr® Liquid Hollandaise, lime juice, chipotles and water and puree until smooth. Season with salt.